On Christmas Eve, we did one of our usual hikes in the Phoenix area (South Mountain’s National Trail), and afterward, we decided to grab a late lunch. Of course, this isn’t always the easiest thing to do on Christmas Eve, since most businesses aren’t open (in the past, we’ve ended up at TGI Friday’s for similar reasons). 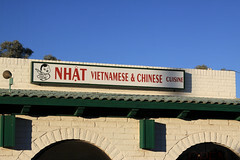 Of course, Southwest Mesa (and the adjoining area in Chandler) have developed a substantial Asian population, and now the area between Dobson and Alma School from roughly Main Street in the North, down to Ray Road in the South, has gotten quite the selection of Vietnamese Pho shops. 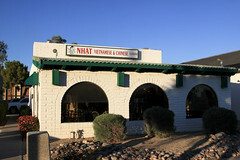 Several of these were open on Christmas Eve, including Pho Nhat on Southern, across from Mesa Community College. Nhat is a classic example of “Taco Bell Reuse Architecture”, and, indeed, I remember when this actually was one of the classic Taco Bell locations (back when they had an actual bell). I’m always surprised that this place isn’t still a Taco Bell, since the location (across the street from a major community college) would seem to be good for that sort of business. But in any case, the cheap pseudo-Tex-Mex fast food scene’s loss is our gain, since Nhat offers up a wide selection of Vietnamese dishes to the local community (including those same hungry students). After looking over their menu, we both ended up selecting a side order of cha gio, and a different pho selection. 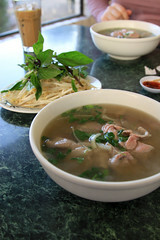 Carol opted for Pho Bo Vien (with the meatballs), while I did my standard Pho Tai Gan (Pho with rare beef and tendon). The eggs rolls came out fairly crispy, awhile they had a nicely crisped exterior and a good overall flavor (I love it when proper Vietnamese egg rolls actually taste of pork), but I found the interior a little bit mushy for my tastes, and I generally prefer when cha gio are served up with lettuce. Still, these were quite good. As far as the Pho itself? While the bowl itself arrived looking a little drab and murky, this was actually quite the good bowl of Pho Tai Gan. The broth itself was flavorful and aromatic, the noodles not overcooked, and the veggies all nicely crisp and fresh (including some of the nicest specimens of Thai Basil I’ve seen in a long time). My beef was obviously freshly sliced and put in the hot broth, still being tender and flavorful (I’ve noticed that if the rare beef in pho sits in the broth too long, it becomes leathery), and the tendon was perfectly done little pockets of chewy beefiness. Overall, I was rather pleased by Nhat, not only for their being open on Christmas Eve, but providing another pleasant Vietnamese dining experience near my parents’ home. I hale from Nashua NH, Heading to Mesa for work. And saw this place, I hope it is as good as Vietnam Noodle House in downtown Nashua. Great review, Ill update once I dine. It should be. 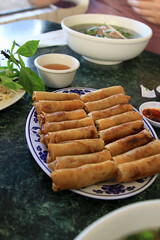 Note that the “Dobson Ranch” area of Mesa now sports quite a few Vietnamese places. I picked Pho Nhat since it was open that day, and since I have a weakness for “Taco Bell Re-use architecture. I know that Pho Thuan Thanh and Pho Number One also get good marks, but weren’t open when I was craving Pho. Recent work travel has taken me to several conferences at the Gaylord resort at National Harbor in Maryland. Considering that the DC area generally has rather good transportation, National Harbor is notable in that it doesn’t; it’s mainly it’s own little isolated enclave with a large resort, a casino, and a handful of touristy restaurants (although among the various tourist joints are a few serviceable places like Nando’s and the quite good Succotash). And while I do love some Nando’s, I was really in the mood for something more like Peruvian chicken. As you may remember from my reviews of Super Pollo or El Pollo Rico, I rather enjoy a good, fresh, Peruvian-style pollo, and the DC area does have a lot of options. So, on a recent trip to National Harbor, I called up my friends Jen and Tom, and they came and took me to Oxon Park (just barely beyond what I’d call a “long walk” from the Casino to a fairly new joint in Oxon Hill called El Rancho.